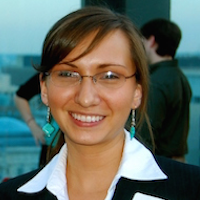 Jessica Koski, a member of the Rural America In These Times Board of Editors, is Ojibwe from the Keweenaw Bay Indian Community (KBIC)” of the Lake Superior Band of Chippewa Indians. Jessica currently works for KBIC’s Natural Resources Department as a mining specialist helping to build the capacity of her community to address mining in the Lake Superior basin. Jessica lives in Baraga, a town in Michigan’s Upper Peninsula and holds a bachelor’s degree in social science from Michigan Technological University and a master’s degree in environmental management from the Yale School of Forestry & Environmental Studies. From 2011-2014, Koski served on the National Environmental Justice Advisory Council’s Indigenous Peoples Working Group charged with providing recommendations for the U.S. Environmental Protection Agency’s Policy on Environmental Justice for Tribes and Indigenous Peoples. In March 2012, Koski co-authored a statement on mining activities that the KBIC submitted to the United Nations Special Rapporteur on the rights of indigenous peoples.